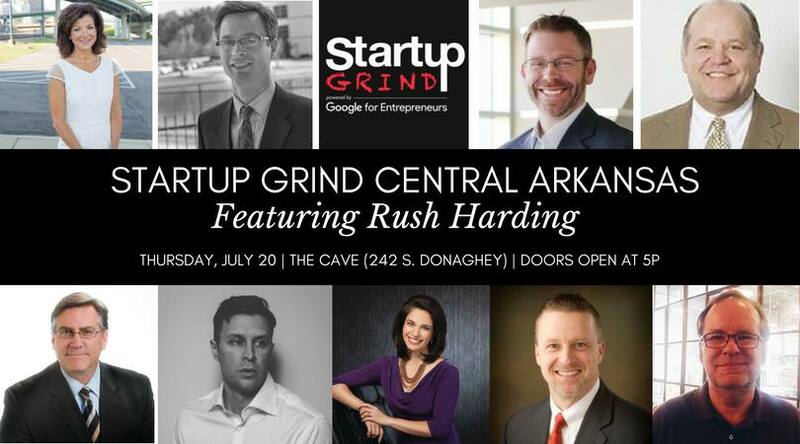 The successful business professional fireside chat Startup Grind Central Arkansas will feature Rush Harding on Thursday, July 20, 2017, at The Cave on the campus of UCA. The doors open at 5:00 PM with the chat starting at 6:00 PM. Networking over Tacos4Life will take place from 5-6 PM. Rush F. Harding, III graduated from Clarendon High School in Clarendon, Arkansas in 1972. In high school, Rush was President of the student body. He was an Eagle Scout, captain of the football and basketball teams and Governor of Arkansas Boys’ State in 1971. He was Co-valedictorian of his senior class. He received an appointment to the United States Military Academy at West Point from Senator John McClellan in 1972. He transferred during his sophomore year to what is now the University of Central Arkansas. As a student at UCA, he was a member of the men’s basketball team, a member of the Pi Kappa Alpha fraternity, and a member of the Wesley Foundation. He was President of his social fraternity, made the Dean’s list and graduated with honors with a degree in math and English. Upon graduation, he joined T. J. Raney & Sons and in 1979, along with Adron Crews and five other partners founded the investment banking firm known as Crews & Associates. He served Crews as Executive Vice President from 1979 to 1996. He was named President in 1996 and Chief Executive Officer in 2000. Crews & Associates was sold in 2000 to First Security Bancorp, a $5.5 billion bank holding company headquartered in Searcy, Arkansas. He currently serves on the board of First Security Bancorp and St. Vincent’s Hospital. He is a former long term board member of Pulaski Academy. He served on the Board of the University of Central Arkansas for four decades and was named a “Distinguished Alumnus” in 2006. He has served on the Boards of the Arkansas Arts Center, Philander Smith College, and the Methodist Foundation of Arkansas. He is a member of the First United Methodist Church in Little Rock. He and his wife, Linda, were named “Arkansas Outstanding Philanthropists of the Year” by the Association of Fundraising Professionals in 2007. Rush was named “Arkansan of the Year” by Easter Seals of Arkansas in 2014. Startup Grind Central Arkansas, powered by the Conductor and Google for Entrepreneurs, is a monthly fireside chat with an influencer, expert or entrepreneur. The events are casual by design — no PowerPoints or presentations — just a casual fireside chat to engage, educate and connect the community. The chats are one hour long, followed by an audience Q&A.